Finally, we are coming to the end of the Animal Crossing saga on Bri’s Book Nook! After going through all of the things that I didn’t like about the previous Animal Crossing games and all the things that I loved about the previous Animal Crossing games, I am ready to discuss what I am looking forward to/hoping for with the Animal Crossing Nintendo Switch release! Nintendo SAID that the game would be released sometime in 2019, but here we are, in April, without so much as a basic gameplay trailer. They have more of a trailer for Pokemon Sword and Shield that were just announced in February and aren’t supposed to be released until “late” this year. But I digress. Here we are, I’m still hopeful and excited, and here are things that I would like to see in Animal Crossing Switch! 1) A way to play Island multiplayer games with anyone without needing a Friend Code. A Club Tortimer pass allows you to join islands and play minigames with random people from around the world. I know Club Tortimer exists in the 3ds version, but most people never got the 50 medals or never had the Club Tortimer pass appear in the island store. For example, I played the game for over 200 hours and only remember seeing the pass at the island store once, buying it, and never getting to use it. If this was included in the Switch version once you pay the more reasonable amount of 1000 bells to unlock the island, more people would definitely use it. Nintendo parental controls can have the option of turning this off in the game if they don’t want their little kids to play with strangers, but the teen and adult fanbase should not have to resort to online forums in order to find people to play with. 2) A cool way of traveling to other people’s towns, like the hot air balloon idea from this video. 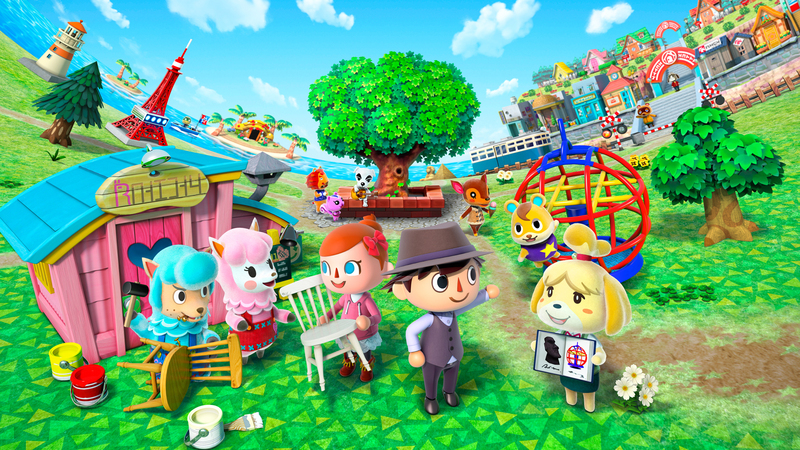 Each Animal Crossing game has had a cool way to travel to another person’s town for multiplayer. Whether it be a gate or a train, it was always a little fun cutscene to look forward to. In this Animal Crossing imagined video, the idea of having hot air balloons be used to transport players was brought up. I think this would be amazing, fresh, and something that players wouldn’t expect. Something awesome for this awesome new game that players have waited 7+ years for! 3) Igloos and tents for the villagers to live in during winter and summer! I mentioned this in my Gamecube Love comments, and I will say it again. Allowing the villagers to live in their own little vacation tents during the “vacation” seasons was one of Animal Crossing’s cutest concepts that they never truly brought back. The campers from the campsite could even be included for the fall and the spring, it just makes the animals feel as if they have lives outside of their tiny houses! 4) Theater for in-game plays, movies, and KK Slider shows. I never liked having KK Slider in the nightclub, but the coffee shop is definitely too small for such a star. Having a theater in-game would allow you to hear KK’s music on a proper stage! It could be a small concert on Saturdays, but it would still be in a proper hall. The game could also include clips or the Animal Crossing movie from 2006 in full to watch in the theater with your friends. Or the animals could put on little plays from time to time as a way to bring even more life to the village. 5) Options for your best friends to buy vacation homes in your village or on your island. I would love if my friends who visit my town often enough could buy a vacation home. They would be able to then use their own furniture or have furniture from my Nook store sent to that home so that they could decorate a little place for themselves to stay when they come to visit me. It could be locked behind some sort of visit number wall, like 10 visits and then the option becomes available. And of course, both parties would have to agree on a location. But it would be a cool little inclusion! 6) Villagers with original personalities. AI has improved so much in the nearly 20 years since the first Animal Crossing game was released in 2001. Nevertheless, I think some of the best personalities I saw were in the Gamecube version of the game. The villagers would hold grudges against one another, would have best friends, would have stories as to why they were lending items everywhere, and were generally sassier. Now, even the “Snooty” or “Mean” villagers are nice. I hope that the villagers’ original attitudes are included in this new version so that they can feel more alive instead of perfectly happy carbon copies of one another. 7) The inclusion of a new city with new shops. I loved the city in City Folk, and I loved the new shops in New Leaf. Now, I hope that these new shops are incorporated into the Switch release, along with a few other ones, in the form of a city you can travel to by your own custom car. One new shop example would be an ice cream parlor where you can sit with friends, listen to KK Slider on an old jukebox, and buy some ice cream and other sweet treats. Or, it could be like a Japanese restaurant where everything is in Japanese and you can order traditional Japanese foods. 8) Allowing the player to customize their car to the city, boat to the island, and hot air balloon to other player’s villages. You could customize your van in Animal Crossing Pocket Camp, so I hope that the creators of the Switch version are planning on allowing you to customize your modes of transportation in this game. It would be such a neat little feature to choose from predrawn patterns and just add color or to be able to design your own car’s patterns. 9) In game multiplayer voice chat! The Wii version had WiiSpeak, so there is literally NO excuse for the Switch version not to have some sort of voice chat almost 10 years later. You can use voice chat in Warframe, so I highly doubt that the creators of Animal Crossing would be foolish enough to allow this game to come out without adding options for voice chat. 10) Be able to draw your own patterns/designs for furniture. Some people have already figured out how to draw their own designs for furniture, so I am hoping that the creators will just make this a general feature. It would be fun for all ages, as those who don’t draw would be able to color their furniture to match the room, kids could make their drawings come to life, and artists would be able to truly customize their houses from top to bottom. This is probably the easiest feature to implement as other games already have the ability to design clothing, so the creators really should do this! Thank you for reading, I hope Animal Crossing is announced for the Switch soon!